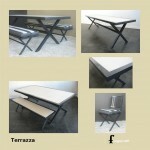 Terrazza is a robust geometric designed indoor or outdoor steel furniture range. Terrazza table has a diagonal cross refectory style base with an inset lightweight GRC concrete top. Available in dining table, dining chair and bench seat.